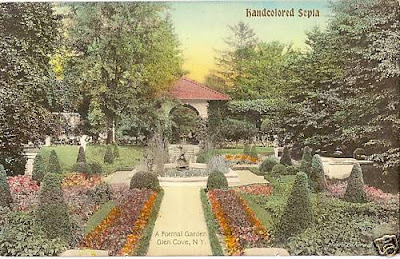 A colorized photo of one of the numerous gardens at Joseph R. DeLamar's 'Pembroke' in Glen Cove. This is one of those instances where one wishes to say, "What's Japanese about it?" So do you know what this garden was called? The garden pavilion with its red tiled roof still stands where it faced the front entrance.